There were 650 press releases posted in the last 24 hours and 153,987 in the last 365 days. Simple buttons are used to represent analysis functions. Nodes with parameters are graphically linked to create analysis tasks. Elemental maps, depth profies, and quantitative results are easy with the new software. REDMOND, WASHINGTON, UNITED STATES, June 30, 2017 /EINPresswire.com/ -- Laser-induced Breakdown Spectroscopy (LIBS) is an emerging analytical method challenging traditional methods such as laser ablation ICP-MS by providing much-improved speed and ease-of-use. Typical analysis of LIBS spectra involves exporting data from the LIBS system to dedicated chemometrics software. AtomTrace has developed AtomAnalyzer(TM) software to take the pain out of LIBS data analysis. Using innovative drag-and-drop methods that allow clear visualization of the workflow and quick feedback of results, users can quickly optimize the treatment of their data. Changing the method involves simply dragging an analysis block in or out of the sequence and setting parameters. Gone is the need to import and export data to multiple programs, spreadsheets, and graphing programs. Each operation in AtomAnalyzer is represented by a so-called Node. Connections between the nodes, combined with the order of operations, creates a processing sequence which can be used for automated spectra analysis. Everything is included for detailed standard or chemometric analysis, visualization, and reporting. In addition, modules allow for Python and R scripting for specialized routines, allowing the software to be personalized and infinitely extensible as new methods are developed. 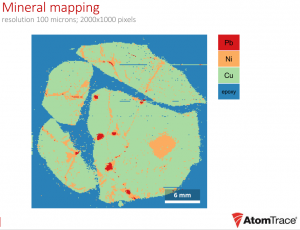 Using AtomAnalyzer software it is easy to create elemental maps of samples, depth profiles, or quantitative calibrations for analysis. Use of the software is as easy as connecting the dots. Methods developed in the R&D can be released to production technicians for routine use. AtomAnalyzer software has been optimized for speed and extensibility, such that the most demanding laboratory and production applications can be accommodated. This innovation is the brainchild of the engineers at AtomTrace, who have worked for several years to make their vision of simplicity a reality. Flash Photonics, Inc. is proud to be the North American distributor for AtomTrace. Simple. Easily-reconfigured. Powerful chemometrics. AtomAnalyzer.